It was Cal vs. Stanford today and -- as is usual -- Stanford prevailed. 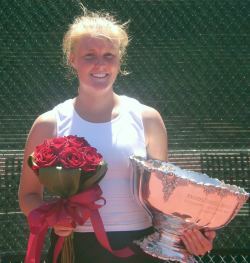 Alexandra Podkolzina and Theresa Logar battled for the Girls 16 USTA Super National Hard Court Championships and it was incoming Cardinal Theresa who shocked the defending champion for the title. The match begin with Alexandra (or Sasha, as she is known) clearly in the lead. Through the long, powerful baseline ralleys she seemed to play without much effort while Theresa struggled through. The first set was an easy 40 minute win for Sasha, but that was not the tone of the rest of the match. Theresa Logar came back in the second set with determination. She led the points to a 6-3 victory. The third looked to be up for grabs until Theresa broke to 3-1. 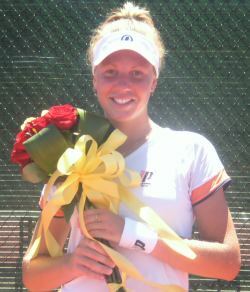 She didn't let up from there until she had the trophy and the US Open wildcard at 6-4. In the third place playoff, Iris Ichim proved that experience pays off as she easily defeated Mary Gambale, 6-1,6-3. Though this wasn't her year, the 14 year old Mary will have many more tries to show her talent and break through. Polina Zaretser took fifth place after a default... and a default... and a default... and a default. Though she didn't have to play her last four matches because of player injuries, Polina worked hard work at the beginning of the tournament and proved her sportsmanship by patiently waiting around for matches for three days. This year's Maureen Connolly Brinker award went to champion Theresa Logar. The USTA Sportsmanship award was given to Catrina and Christian Thompson and the Chairman Sportsmanship Award was given to Iris Ichim. 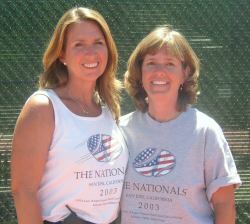 One footnote... the Girls 18 "Nationals" at San Jose would not be the event it is without the hard-working efforts of Tournament Directors Jennifer Pitzen and Andrea Norman (pictured above right). They are there one hundred percent, whether it is scheduling a match, housing a player or consoling a girl who has lost. GrubHub order with this link! 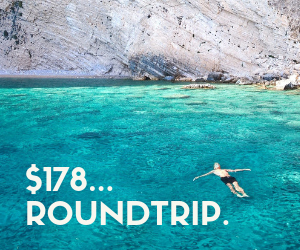 Save up to 30% on your hotel on your next upcoming trip! !